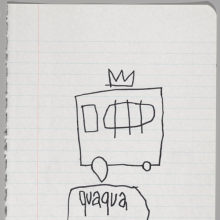 Crowns appeared in Basquiat’s work as early as the SAMO© street writings, and by the early 1980s the three-pointed crown had become a common element in his work. 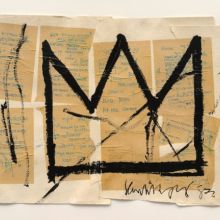 Although other artists also used the crown, this symbol came to be closely identified with Basquiat through his sheer repetition of the image. A shorthand for royalty, heroism, and elevated status, Basquiat’s crowns appear on figures and objects or stand on their own, as in Untitled (Crown). 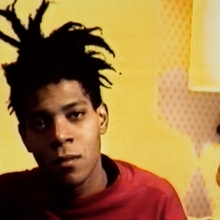 Basquiat reproduced that iconic collage in the monumental silkscreen print Tuxedo. 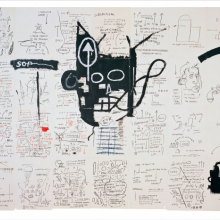 For this work Basquiat produced twenty-eight original drawings and mounted them on canvas in a gridlike arrangement. Layering text and image in a manner reminiscent of graffiti and the free association of his encyclopedic notebook subjects, he created the effect of book pages laid out in sequence. Visible through an abstractly rendered head of an African American male, these language-rich drawings combine scientific diagrams, pictographic notations, bits of world history, and enigmatic references such as THE OBSERVATORY FROM THE JAMES DEAN MOVIE and GORILLA TELEPATHY. 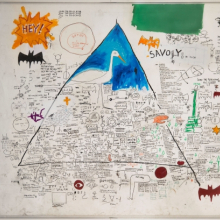 Along with Untitled (Ideal), this work is one of a number of Basquiat’s paintings and drawings that resemble his notebook entries, as if the artist had superimposed a page of writing onto a minimally painted canvas. 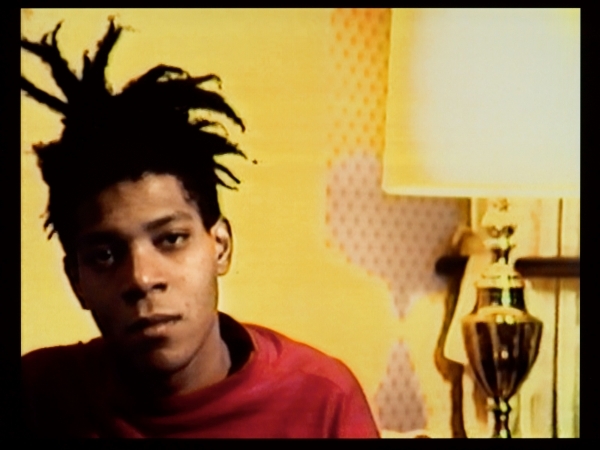 Basquiat often depicted notable works from art history, recasting them as the subjects of his own interpretation. 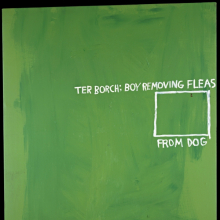 In this instance he condensed the painting The Flea-Catcher (Boy with His Dog), by the seventeenth-century Dutch Baroque master Gerard ter Borch, to a few lines of text and a simple square. The absence of imagery in Basquiat’s painting plays against Ter Borch’s careful attention to detail at the same time that it implies Basquiat’s respect for the original. 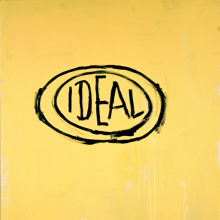 The copyright symbol appears throughout Basquiat’s notebook texts and larger compositions as a gesture of reclaiming words and ideas for his own use and a comment on consumer culture. 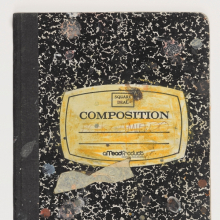 The © symbol can be seen on numerous pages in this notebook from about 1987. 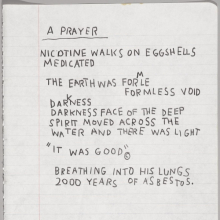 In the narrative poem A PRAYER, for example, Basquiat alludes to the biblical story of Creation in the book of Genesis with the phrase “IT WAS GOOD”©.